We’d love your help. Let us know what’s wrong with this preview of Frogs! by Laurence Pringle. To ask other readers questions about Frogs!, please sign up. Be the first to ask a question about Frogs! The best thing about this book is Henderson's illustration. The photo-realism is among the best I've seen in the trompe-l'oeil tradition. This is because at first glance and from a distance it looks like photography, but when I stopped and actually looked and started to read, it was easy to see the watercolor technique. So it doesn't have the saturated or airbrushed feel the photorealism of the 1980s had. As differentiated text, this book brings up some interesting feature issues. In words, the The best thing about this book is Henderson's illustration. The photo-realism is among the best I've seen in the trompe-l'oeil tradition. This is because at first glance and from a distance it looks like photography, but when I stopped and actually looked and started to read, it was easy to see the watercolor technique. So it doesn't have the saturated or airbrushed feel the photorealism of the 1980s had. As differentiated text, this book brings up some interesting feature issues. In words, the book only deals with two main structures: labeled 'portraits' of types of frogs, and the 'chapter' text itself. Each double page spread is a self-contained sub-topic (or sometimes two topics, one for each page), which is a good form of differentiation that clearly encourages browsing. I thought it was interesting that Pringle (and the book's unnamed designer) decided not to use any kind of titles or headers to call out these topics. In a way, I like this, because it lets the visuals dominate while the topic sentences clearly introduce the focus of the 'chapter'. 2. This book is about a young frog who does not want anything to do with being a frog. He goes through different kinds of animals he would rather be like a cat or a rabbit. He talks about the characteristics he doesn't like about frogs like being too wet and slimy and eating too many bugs. At the end, there is a wolf who tells him how good it is to be a frog because wolves don't eat frogs. This could give children a better look at what animals are and are not predators of frogs. 3. The text structure of the book Frogs! is descriptive. Each page describes many aspects of frogs like the type, location, body parts, and other special characteristics. There are many text features throughout this book that help with the descriptions of body parts or specific types of frogs such as captions and diagrams. In only 32 pages this book presents a great quantity of fascinating information and illustrations featuring frogs and toads, which are also frogs. The author takes an unusual approach by beginning the narrative with, “Make a sound like a frog. Go ahead. Pretend you are a frog and make its sound.” Then he explains that frogs from many parts in the world make a great variety of sounds, even some that resemble quacking and barking. By reading along a student learns the meaning of the terms amphibian In only 32 pages this book presents a great quantity of fascinating information and illustrations featuring frogs and toads, which are also frogs. The author takes an unusual approach by beginning the narrative with, “Make a sound like a frog. Go ahead. Pretend you are a frog and make its sound.” Then he explains that frogs from many parts in the world make a great variety of sounds, even some that resemble quacking and barking. By reading along a student learns the meaning of the terms amphibian, herpetologist (scientists who study frogs), and anurans (animals in the order Anura, which means “without tail”). Students may already know that frogs come in many sizes and colors, but here they also learn about the different environments where frogs live, and how different types of frogs move – which can be running or even gliding through the air between branches. This book provides a nice explanation of how species of frogs differ and how they are alike, with examples and illustrations of species from around the world. Habitat destruction and endangerment are also covered. Watercolor illustrations fit nicely with the text, showing details of frogs’ forms, colors, and environment. In a seek-and-find two-page spread the reader is asked to find 8 types of frogs whose camouflage help them blend into surroundings. The material is not divided into in chapters and there is no index, but some websites about frogs and habitat conservation are listed in the end. This is a terrific nonfiction book about frog that is just filled with fascinating facts, but is not overwhelming in its detail. We learned so much from reading this book - I had no concept about the diversity of the frog population around the world. We discovered that there's a paradoxical frog in South America whose tadpole is more than three times larger than the adult frog. We learned that of the more than six thousand kinds of frogs in the world, only the Pacific tree frog of the western Un This is a terrific nonfiction book about frog that is just filled with fascinating facts, but is not overwhelming in its detail. We learned so much from reading this book - I had no concept about the diversity of the frog population around the world. We discovered that there's a paradoxical frog in South America whose tadpole is more than three times larger than the adult frog. We learned that of the more than six thousand kinds of frogs in the world, only the Pacific tree frog of the western United States actually says, "ribbit," And we read about a now-extinct gastric-brooding frog in Australia who would keep her fertilized eggs in her stomach for six weeks (without eating that whole time) until little froglets were developed enough to hop right out of her mouth. Amazing. The illustrations are terrific, showing the fine details of each creature. We've been reading a lot of science books, especially ones by Seymour Simon. Many of these books rely on big, glossy color photographs to truly capture the creature or scientific principle being explained. But the watercolor illustrations by Meryl Henderson are just fantastic. We really enjoyed reading this book together. This book does a great job of informing readers about how all frogs are not the same. All frogs vary in their size, color, sounds, mating, and the ways they live. There are labeled illustrations in this book that show how many different types of frogs there are-and that’s not even all of them! Readers will enjoy learning about different types of frogs as well as their life cycle. 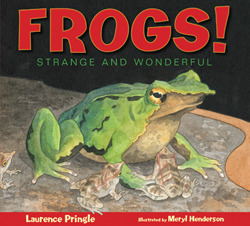 It is a very informative book that encourages readers to examine what makes frogs strange and wonderful. This book is simply about all sorts of different kinds of frogs and what they can look like and what they can do. I liked this book because I know my boys would love it, but it's very lengthy so students might lose interest as you read. I would use this book on the shelf for my boys, but I would also do a read aloud or book talk with it so students can learn about frogs. I thought this was a really good nonfiction book and would work well on the WAW list. I didn't know much about frogs but sure learned a lot, especially about the variety of frogs out there. Some frogs actually have live births! But the text flowed easily and was well-supported by the clear pictures. A yes vote for me. Reflection: This book is a wonderful content book about frogs. This would be a great book to introduce to your class when beginning units about life cycles, endangered species, or even talking about textures, colors, etc. This book is a wonderful book to use when teach students about frogs or when teaching students about the different animal classifications.It would also be great for teaching about the life cycle of frogs or endanger species facts. This book would be best for 3-5th graders. Description: This book lists different types of frogs (the Goliath frog, tiny gold frog, tree frogs, etc) and lists facts and descriptions incluiding their habitats, their defense mechanisms like camoflauge, and more. Starts by introducing the basic characteristics of amphibians. Continues with information detailing the adaptations that enable frogs to survive in various ecosystems. Use with primary animal units or intermediate units on animal adaptations. J597.89P Interesting and informative although a bit detailed for K-1st grade. Nice illustrations. This book is a good science book for younger students. It talks about different facts about frogs. The book goes through the life cycle of the frog, and talks about where they live. Interested in frogs? Pringle does a pretty thorough job with this nonfiction picture book about frogs, their habits, habitats, life cycle, etc. Cool illustrations and lots of details. Another wonderfully wide introduction to a type of animal. Discussion of extinction at the end. Very nicely illustrated, informative book about frogs.